Anyway, let’s just into it! If you follow me on Instagram…and you should (@ronnalouise). Shameless plug, I know. But like I was saying…If you follow me on Instagram you know I try to spread as much body positivity as possible. At first, I was stumped because honestly there are so many days where I hate what I see in the mirror, so there was no way I could answer this question honestly. But I sat down and really thought about it. Even the skinniest of girls suffer from body image issues. Body positivity and body image are not only exclusive to “thicker” women. Anyone and everyone can have these issues with themselves. So when I was thinking about it, I tried to envision what made me feel good about myself and what made me feel shameful of who I am. But I wasn’t done thinking about body image/positivity. This focused thinking then lead me to the thought of “why/when did I gain all this weight?”. And you would be so surprised at the answer because honestly, it’s so simple. As many of you know, especially if you have read my previous blog posts. I was in an extremely toxic and unhealthy relationship for about 4 years before I met my current boyfriend. With that being said, I was in a constant state of stress. I had horrible anxiety on a daily basis and due to that I simply didn’t live a very healthy lifestyle. I had this anxiety because my ex was constantly off either doing drugs, getting drugs, talking to other girls…the list goes on and on. So with that being said, I never knew where he was, if he was safe, if he was hurt or even dead, so I was a living, breathing stress ball! And since I was a ball of anxiety I didn’t eat a lot. Honestly, all I did was drink coffee all day to the point of getting the shakes. And then the next day I would do the same thing all over again. So I dealt with this anxiety-riddled life for about 4 years until we broke up. I was able to be myself completely without the fear of being torn down, I no longer was riddled with anxiety because he respected my boundaries and always told me where he was and if he had gotten home safe. Literally, everything about him was the exact opposite of what I was used to. So with happiness, comes food. Always. Think about it, every single party has good food, to celebrate something you go out to dinner and the list goes on. So Vincent and I went out to eat a lot, or cooked meals, or even went out for ice cream. which caused me to gain weight. This new found weight obviously didn’t “sit” well with me. I like to call relationship weight being “fappy”, because typically when you’re happy you gain weight. So fat/happy. It’s a simple science, I promise. But this meant I had to once again learn to love myself at everything single stage of my life. Whether I’m a size 3 or a size 10. I need to feel beautiful. And believe me, some days are easier than others. I have struggled with my body image ever since I was around 7 years old. So this is nothing new to me. So if you’re someone like me and you struggle with this, please know you are not alone! Sfromof the most beautiful men and women suffer with body image issues. It’s not just “thicker” women. THROW AWAY YOUR “SKINNY” CLOTHES! Okay, this is one I struggled with for YEARS! I always kept a pair of jeans that I liked to refer to as my “skinny” jeans in hopes that one day I would fit back into them. Honestly all that this did was make me feel even worse about my body when I couldn’t fit into them. So throw all of them away! And go out and buy yourself a new wardrobe. Buy clothes that fit your current body type and that make you feel confident. Don’t worry about the size either. This still bothers me when I go into a store thinking I’m going to be a medium or a large in a shirt since that’s what I am at every other store and then all of a sudden I’m an XL there? Like wtf! Don’t let this discourage you – sizing is fucked up an it’s not you! Follow other men and women with similar body types to you on social media. I actually wrote a whole post all about my favorite body positive social media accounts to follow. Click here to read it. Following people that look similar to your body is so life changing! I mean it. It has helped me tremendously. 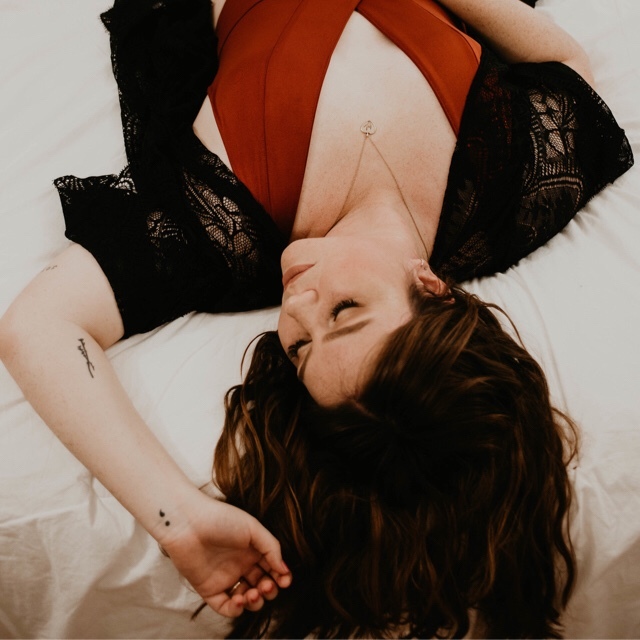 Not only is it great to see someone you find beautiful rocking their body, but it’s also great to find out some tips on how to pose for photos that are flattering to your body type or even clothing that will make you feel confident! Tell yourself the you are beautiful and worthy every single damn day – even if you don’t believe it. This one was really hard for me for awhile. I hated to tell myself that I was beautiful, because I didn’t believe it. But one of my old therapists told me to just keep doing it! So I would leave myself encouraging notes all around my room on my mirrors like “you are beautiful”, “you are worthy”, “you are enough”, and slowly but surely I started to believe them. I still struggle with it, but each day I tend to believe them more and more.